HUNTSVILLE, Ala. — On May 15, NASA’s Space Launch System (SLS) core stage engine section structural test article (STA) arrived at NASA’s Marshall Space Flight Center (MSFC) in Huntsville, Alabama. The STA will soon be placed in a test stand located in MSFC’s Building 4619 and subjected to extreme loads to certify the section for flight. 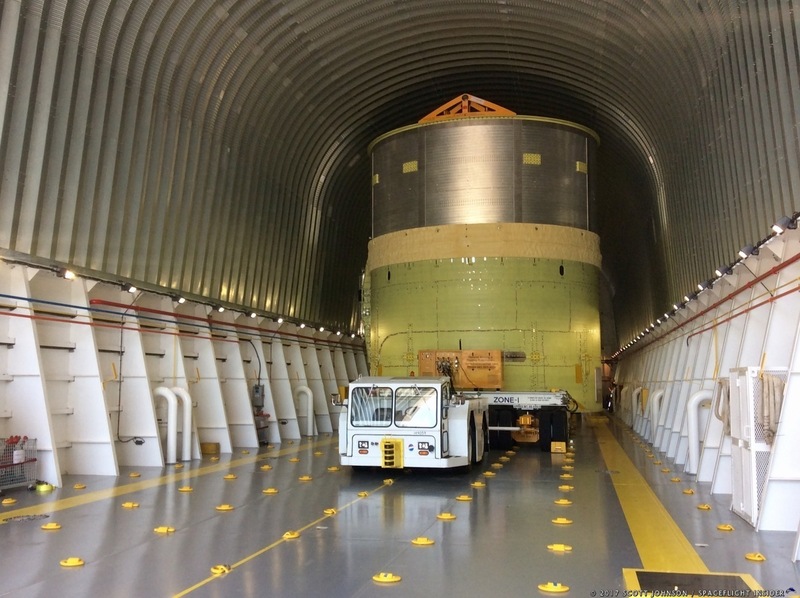 The STA – one of four manufactured by SLS contractor, Boeing, at the agency’s Michoud Assembly Facility (MAF) in New Orleans – is the first to be transported to MSFC for testing. The STA departed MAF, via NASA’s Pegasus barge (towed by two tugboats: Miss Becky and Sacred Heart), on April 28. The journey from New Orleans, via the Mississippi, Ohio, and Tennessee Rivers, covering 1,240 miles (1,996 km), was expected to take 10–12 days but ended up taking 17. Heavy rainfall forced an unplanned five-day mooring in Cairo, Illinois, to allow time for high water to recede so that the barge could clear several low bridges along its path. 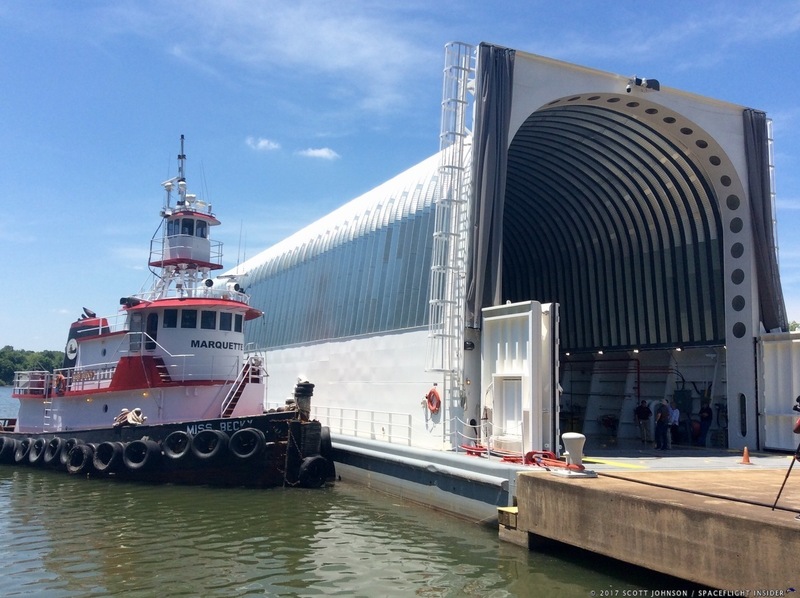 On May 17, the engine section STA was offloaded from Pegasus onto the MSFC Tennessee River dock and transported to Building 4619, where it was placed on a temporary stand awaiting placement in the actual test stand in about a week. The test stand will be built-up around the STA over the next five to six months. Testing is scheduled to begin in the late fall or early winter, and will continue for four to five months. Once testing begins, 55 hydraulic actuators will push, pull, and twist the STA in the test stand to verify that future flight articles will withstand the forces of launch and flight. SLS is NASA’s new super-heavy-lift launch vehicle, which, among other missions, will be capable of carrying astronauts to orbit in the agency’s new capsule, Orion, for deep-space missions to Mars and beyond. Its first flight, Exploration Mission One (EM-1), an uncrewed flight around the Moon, is expected to take place in 2019. The SLS engine section makes up the bottom of the 212-foot-long core stage and is the sole attach point for the four RS-25 engines and the rear attach point for the two strap-on solid rocket boosters (SRB‘s). For more photos from MAF, prior to the STA departure, click here; and for more photos from the MSFC STA arrival, click here.